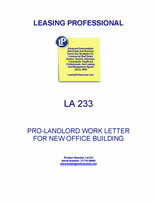 THIS WORK LETTER ("Work Letter") sets forth the agreement of Landlord and Tenant with respect to the Tenant Improvements and Landlord's Work to be constructed on the Property. In the event of any inconsistency between the terms of this Work Letter and the terms of the Lease to which this Work Letter is attached and made a part thereof, the terms of the Lease shall control. All defined terms used herein shall have the meanings set forth in the Lease, unless otherwise defined in this Work Letter. 1. Landlord's Work. Landlord, at its sole cost and expense, shall perform or cause to be performed the "Landlord's Work," defined herein to mean construction of a building shell substantially in accordance with final plans and specifications to be submitted to and approved by the Tenant as provided herein and by the City (once so approved, the "Final Shell Plans"), which Building Shell shall contain only the items listed on Exhibit B-2 or shown on the Final Shell Plans (the "Building Shell"). Landlord's Work shall upon completion be in compliance with all then applicable Laws and Private Restrictions (except to the extent noncompliance is the result of Tenant requested changes in the Preliminary or Final Shell Plans). Landlord's Work shall be performed using a general contractor selected by Landlord. 2. Landlord shall cause XYZ Architects ("Architect") to prepare initial plans for construction of the Building Shell based on the shell specifications attached as Exhibit B-2 and the site plans attached as Exhibit B-3 (the "Preliminary Shell Plans"). The Preliminary Shell Plans shall provide for accommodation of Tenant's sewer line in the Building' slabs and may incorporate either of the site plans attached at Exhibit B-3 or be a combination thereof, as reasonably approved by Landlord and Tenant as set forth below, provided that in no event shall the design of the Project provide for a lobby larger than _________ square feet or for a number of parking spaces less than 3 spaces per 1,000 (in Landlord's discretion, provided that in no event shall the parking be less than 2.75 per 1,000) Rentable Square Feet (excluding the Rentable Square Feet of the lobby). Landlord shall submit the Preliminary Shell Plans to Tenant for Tenant's approval. Tenant will provide written approval of the Preliminary Shell Plans within five (5) days after such submission. If Tenant disapproves any part of the Preliminary Shell Plans, the disapproval shall include written instructions adequate for Architect to revise the Preliminary Shell Plans. Such revisions shall be subject to Landlord's approval, which shall not be unreasonably withheld, provided that neither Landlord nor Tenant shall be entitled to request or require changes to the Preliminary Shell Plans to the extent inconsistent with Exhibits B-2 and B- 3. Tenant will finally approve the revised Preliminary Shell Plans within two (2) business days after submission thereof to Tenant. If Tenant fails to approve the Preliminary Shell Plans within the applicable periods set forth in herein, then (A) Landlord shall not be obligated to commence construction of the Building Shell, (B) Tenant shall be responsible for any resulting delay, and the cost of such delay, in Landlord's completion of the Building Shell and delivery of the Leased Premises, and (C) any such delay shall be deemed a Tenant Delay (as defined below). After Tenant's approval of the Preliminary Shells Plans, such plans shall be submitted to the City for approval. 3. After approval by the City of the Preliminary Shell Plans, Landlord shall cause Architect to prepare Final Shell Plans. Tenant will provide written approval of the Final Shell Plans within five (5) days after such submission. If Tenant disapproves any part of the Final Shell Plans, the disapproval shall include written instructions adequate for Architect to revise the Final Shell Plans. Such revisions shall be subject to Landlord's approval, which shall not be unreasonably withheld. Tenant will finally approve the revised Final Shell Plans within two (2) business days after submission thereof to Tenant. If Tenant fails to approve the Final Shell Plans within the applicable periods set forth in herein, then (A) Landlord shall not be obligated to commence construction of the Building Shell, (B) Tenant shall be responsible for any resulting delay, and the cost of such delay, in Landlord's completion of the Building Shell and delivery of the Leased Premises, and (C) any such delay shall be deemed a Tenant Delay (as defined below). Landlord's Work shall be deemed to have been "Substantially Completed" or to have attained "Substantial Completion" as and when hereinafter set forth in this subparagraph 1(c). 4. When Landlord receives written certification from Architect that construction of the foundation, structural slab on grade (except to the extent delayed by Tenant's action or inaction, including at Tenant's request to accommodate Tenant's design requirements and/or any underslab aspects of the Tenant Improvements), Landlord's underslab plumbing work, structural steel framework, decking and concrete on second floor, roof structure and installation of main fire sprinkler risers in the Building and all other work shown on the Final Plans (other than the Late Delivery Items and punchlist items) have been completed in accordance with the Final Shell Plans approved by the City and the parties, Landlord shall prepare and deliver to Tenant a certificate signed by both Landlord and Architect (the "Structural Completion Certificate") certifying that the construction of such portions of the Building have been substantially completed in accordance with the Final Shell Plans in all material respects and specifying the date of that completion. To the extent reasonably available from the City, Landlord shall include reasonable evidence that the City has signed off on the items of Landlord's Work. The delivery of such Structural Completion Certificate (and evidence from the City, if any) shall memorialize the date that the Landlord's Work was "Substantially Completed," subject to concurrence by Tenant's architect, which concurrence shall not be unreasonably withheld and shall be given (or reasonably withheld) within five (5) business days after receipt of the Structural Completion Certificate. Within five (5) business after Landlord's delivery of the Structural Completion Certificate, Landlord and Tenant (and/or their representatives) shall conduct a walkthrough of the Building Shell using diligence to specify any items remaining incomplete (pursuant to the terms of the Work Letter) or in need of repair. Landlord and Tenant within said five (5) business day period after their inspection shall prepare a "punchlist" of any items remaining incomplete (pursuant to the terms of the Work Letter) or in need of repair, and Landlord shall cause such items to be completed or corrected at its sole cost and expense within a reasonable time thereafter. Promptly after Landlord provides Tenant with the Final Completion Certificate, Landlord shall cause the recordation of a Notice of Completion) with respect to Landlord's Work. The term "Substantially Completed" shall not include the parking areas or landscaping of the Property (the "Late Delivery Items") or punchlist items. Landlord and Tenant acknowledge and agree that the Late Delivery Items shall be completed by Landlord no later than the date which is the later to occur of (A) the date Tenant actually occupies the Leased Premises for the conduct of its business or (B) __________, 200_. 5. When Landlord receives written certification from Architect that construction of the remaining improvements constituting the Landlord's Work (including the Late Delivery Items and punchlist items) has been completed in accordance with the Final Shell Plans, Landlord shall prepare and deliver to Tenant a certificate signed by both Landlord and Architect (the "Final Completion Certificate") certifying that the construction of the remaining improvements constituting Landlord's Work has been substantially completed in accordance with Final Shell Plans in all material respects, and specifying the date of that completion. Upon receipt by Tenant of the Final Completion Certificate, the Landlord's Work will be deemed delivered to Tenant for all purposes of the Lease (subject to Landlord's continuing obligations with respect to the punchlist items). 6. Notwithstanding any other provisions of this Work Letter or of the Lease, if Landlord is delayed in substantially completing any of Landlord's Work necessary for issuance of the Structural Completion Certificate as a result of any Tenant Delay (as defined below), then the Rent Commencement Date (as otherwise determined in accordance with Article __ of the Lease) shall be advanced one day earlier for each day by which such Tenant Delay delayed completion of the portions of Landlord's Work necessary for issuance of the Structural Completion Certificate, and Tenant shall reimburse Landlord in cash, within thirty (30) days after written demand by Landlord (accompanied by reasonable documentation of the items claimed), for any increased construction-related costs and expenses actually incurred by Landlord as a result of the Tenant Delay, if any. 7. Any request by Tenant for a change in the Final Shell Plans after approval of thereof by Landlord, Tenant and City as provided herein, (a "Change") shall be accompanied by all information necessary to clearly identify and explain the proposed Change. As soon as practicable after receipt of the information describing the requested Change, Landlord shall notify Tenant of the estimated cost of such Change as well as the estimated increase in construction time caused by the Change, if any. Tenant shall approve in writing such estimates within two (2) business days after receipt of Landlord's notice. Upon receipt of such written request, Landlord shall be authorized to cause the Contractor to proceed with the implementation of the requested Change, subject to the City's approval, if required. 8. The increased cost and time, as determined by Landlord, of all Changes requested by Tenant, including the cost of architectural and engineering services required to revise the Final Shell Plans to reflect such Changes and the Contractor's overhead and fee shall be paid by Tenant within thirty (30) days after demand, subject only to Landlord's furnishing to Tenant appropriate back-up information from the Contractor concerning the increased costs and increased construction time.